Mental health has been and continues to be an understated, unaddressed issue. We seek not only to raise awareness and critically analyze the root causes of mental health issues, but also to encourage our communities to directly confront these issues by exploring how an individual’s cultural context and larger institutional systems, such as education and law, influence mental health and promote a culture of stigma and silence. The lack of conversation and open discourse about these issues and “dis-ability” further isolates people who are daily affected but are often subject to sensationalism or are separated from the implied “normal.” We hope to also briefly address the anti-ableist movement and hope that the issues series can be a stepping stone for spreading and increasing campus awareness. We recognize the difficulty in attempting to encompass all cultural contexts. However, knowledge and awareness of those contexts play significant roles in affecting the mental health of our students. 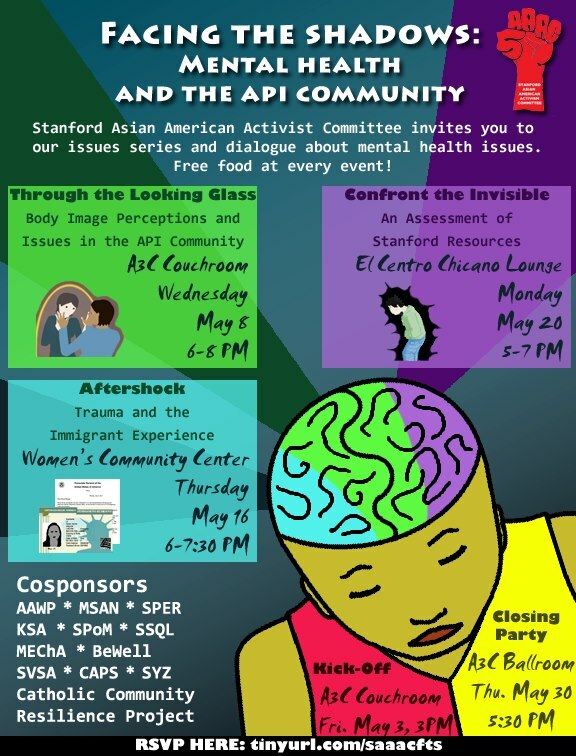 Thus, SAAAC would like to begin a conversation between Stanford students and various panelists, speakers, and students who have encountered mental health issues in the API community. We encourage all students to attend the events and also hope to form alliances with other groups on campus to raise cultural awareness in addressing physical and mental health. We would like to bring these issues to light in the Stanford community, where the reluctance to have open dialogue about mental health further stifles conversation in the API community. Our series of workshops seek to shed light on the wide variety of racial, socioeconomic, and gendered contexts in which mental health issues manifest. We aim to critically evaluate the resources available to students on campus and offer culturally-sensitive and appropriate ways to address these concerns in the API community. Through education, advocacy, and support, we hope to stand in solidarity with the community by building coalitions and shifting the perspective on mental health on campus. For more details on our upcoming workshop series, find dates and times below, and check out our flier and Facebook page. Free food will be provided at all events! Join us every week as we begin to break the silence and taboo surrounding the topic of mental health that stands not only in the API community but also on campus in general. Sunli is a Sophomore involved with SAAAC, the Stanford Asian American Activism Committee.